On Monday (Nov. 26, 2018), Nasdaq Stock Exchange and NASA co-hosted an event in Times Square where agency-affiliated space enthusiasts and the public watched the Mars InSight mission perform landing procedures to ultimately touch down on the Red Planet. 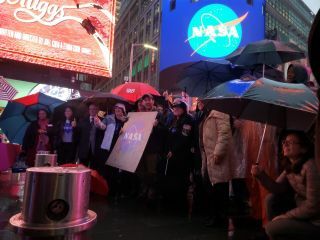 NEW YORK — A group of about 40 space enthusiasts huddled under umbrellas yesterday (Nov. 26) as the lights in Times Square transmitted news of the "perilous" landing maneuver to bring NASA's InSight spacecraft down to the surface of Mars. From 2 p.m. to shortly past 3 p.m. EST (1900 to 2000 GMT), the space agency and the Nasdaq Stock Market co-hosted a gathering at 4 Times Square. While the event did draw some pedestrian curiosity, most of the crowd was NASA-affiliated. At 4 Times Square on Nov. 26, 2018, women huddle under an umbrella to watch NASA TV footage of the InSight Mars landing. "I'm from Connecticut. I drove in, which is kind of wild to do; I parked uptown and took the subway down here," said David Mestre (right). Dawn Tucker, a STEM teacher working in the Bronx and White Plains, New York, is at the left. A block north, the ABC news ticker called the InSight landing "perilous." At the southern corner, the Nasdaq Screen would soon start airing NASA TV. The rain increased, the crowd grew chilly, but the smiles only got bigger. The crowd awaiting NASA TV footage to roll across the Nasdaq screen in Times Square. Mechanical engineer Emily Muggleton stands in front of the ABC news ticker in Times Square as it passes an alert about the "perilous" maneuver to land the NASA InSight mission on Mars on Nov. 26. Emily Muggleton, a mechanical engineer and NASA Solar System Ambassador, found the whole landing event "super exciting." She's working on a space-travel project of her own, too. "Personally, I'm super interested in designing spacesuits. I'm currently making one in my apartment," she said. "I want a spacesuit, and I can't go out and get one, so I'll build one!" She became inspired by spacesuits after working with them earlier in her career. She's currently developing ways to produce hardware for the spacesuit with 3D-printing. "So you want to know if you're alone in this universe, to see whether it's possible for other planets to support life… what better place to start than the planet next door, right?" NASA researcher Allegra LeGrande talked to Space.com in Times Square ahead of the InSight mission landing on Mars. "It's just neat! It piques imagination," Allegra LeGrande told Space.com about InSight. She is a physical research scientist at NASA's Goddard Institute for Space Studies in New York. She said this mission will "plug that gap of knowledge" about what happens under Mars' surface. The InSight mission will operate for two Earth years gathering data about the interior of our cosmic neighbor. To get there, InSight had to first survive its landing. The New York crowd whispered and occasionally shouted updates to one another as InSight endured a dramatic 6.5-minute entry into the Martian atmosphere, and as scientists received data about the entry progress. People shared words of excitement and anxiousness as InSight entered the Martian atmosphere at about 12,300 mph (19,800 km/h). Its heat shield endured temperatures hot enough to melt steel. To touch down on the flat plains of Mars' Elysium Planitia, InSight began igniting its thrusters to decelerate the spacecraft. At 2:53 p.m. EST (1953 GMT), signals confirming InSight's touchdown reached Earth. And as mission team members at the agency's Jet Propulsion Laboratory (JPL) could be seen celebrating on the Nasdaq screen, the Times Square crowd cheered too, even as the hard rain continued falling. After the landing, NASA Deputy Associate Administrator Melanie Saunders and retired NASA astronaut Mike Massimino headed inside to ring the Nasdaq closing bell with other agency personnel, celebrating a job well done. NASA Deputy Associate Administrator Melanie Saunders and retired NASA astronaut Mike Massimino ring the Nasdaq closing bell after the InSight lander successfully touched down on Mars.